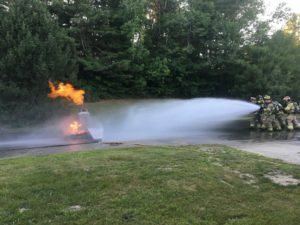 Description: Dräger System 64, a propane-fueled exterior live fire training system designed to help fire departments train on exterior live fires in accordance with NFPA 1001. With this training tool, you can produce repeatable and controllable fires to help your firefighters build the confidence and skills they need to fight fires safely and effectively. NOTE: Prop is unavailable throughout the winter months. November 1st – April 1st weather permitting. This is due to the potential of critical equipment freeze ups. Description: This patented door system provides the ability to force left or right-handed, opening in or opening outdoors, metal or wood jambs. All on the same door system. You can even use angle iron on the door to simulate high security apartment doors. This door allows you to use the gapping method and conventional forcible entry methods on opening-in metal jams (like on apartment doors). Hydra- Rams & Rabbit Tools can also be used. 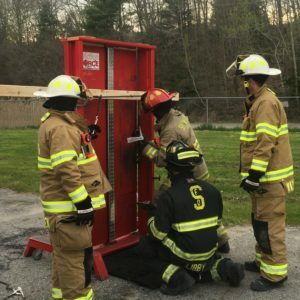 Opening-out forcible entry on metal jambs can also be used (like on commercial buildings or bulkhead doors). Also, you can use the spiking method on the wood jamb simulator (like on private dwelling doors). 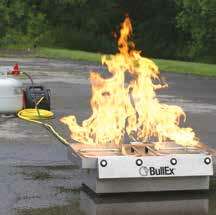 Description: For a realistic fire extinguisher training session, the BullEx I.T.S. ™ Live-Fire Extinguisher Training System is an ideal solution for your safety program. Designed with a patented flame-response technology that detects a trainee’s technique, the system can automatically vary its flames in response, providing a realistic training experience. The system uses readily available air and water instead of costly dry chemical or CO2, meaning multiple employees can safely train in a single day in a clean and cost- effective manner. The I.T.S. system is a simpler, safer way to provide live fire extinguisher training in your facility. MFSI Instructor Required: No, requester must have been trained in accordance with the manufactures recommendations. 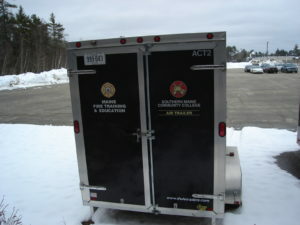 Description: Each of these trailers is equipped with 8 mounted 6000 psi cylinders piped to a SCBA cylinder fill station. CAUTION: Filling SCBA cylinders in an improper manner can be extremely dangerous. This system shall only be utilized if you have been properly trained in SCBA cylinder refill operations. Description: The display cases provides industry product samples that will be used to enhance the building construction curriculums. 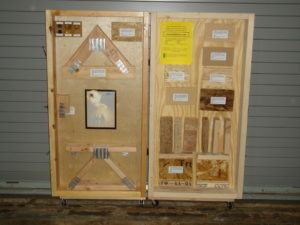 The display case is supported by its own website and is an excellent training aid insofar as engineered wood products that are commonly found in new construction today as well as traditional wood frame construction.